Landline and mobile phones have become very common. Due to high usage, lot of service providers have emerged in different countries throughout the world. 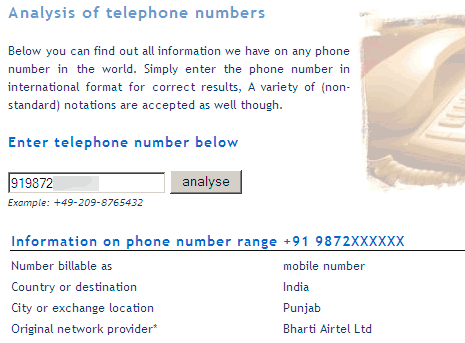 Ever wanted to trace details of a specific (mobile) phone number? Online tool at ‘Numbering plans’ website makes this all easy. 1. Open Numbering plans Analysis webpage. 3. Click Analyse button to see country, city and service provider details. Using this online tool, you can easily see location, country and service provider details associated with any mobile or telephone number (almost! ).